You know there's a problem when even the bad games receive high marks. 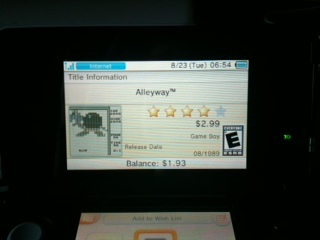 When Nintendo first announced the 3DS eShop, one of the coolest features was the ability to rate games using a five star scale. Granted, a similar system has existed for years on Xbox Live, but when it comes to the big N, better late than never. We knew right away that the company intended to release a slew of obscure Game Boy titles few consumers have heard of, so the reviews would play an important role in purchasing these potential gems. We don't know who reviews these games, but one thing's certain, they love everything. Some review scores make sense. We have no problem with The Legend of Zelda: Link's Awakening DX receiving a perfect five, especially after giving this highly entertaining adventure the exact same score; read the review. Alleyway is OK, but definitely not a four star game. We'll even agree with Donkey Kong and Super Mario Land getting a five and four and a half, respectively. Then we have the head scratching scores that make zero sense. Tennis, one of the most boring Virtual Console games, has a solid four. Same goes for Radar Mission and Alleyway. Even Baseball, without question the worst Game Boy title so far, has a respectable three and a half. We often visit multiple websites for classic reviews, so the odds of us unknowingly purchasing a crap game are slim. Other consumers, sadly, don't have this information, which may result in them coughing up in excess of $2.99 a pop for something they'll play for ten minutes and then delete. Here's the problem. We don't know how to fix this system, or whether it's even fixable at all. 3DS owners either love Game Boy, have an average age of nine or fall into the Nintendo fan boy category, and it could be all of the above. A shame, since no one deserves Game Boy Baseball. No one.